CINCH RSNC will track sorting dollars won and sorting dollars spent on entry fees by each contestant at all CINCH RSNC sanctioned Events. With this data, the dollars won will be divided by the dollars spent on entry fees by each contestant. That will provide every contestant with a win/loss ratio. Example: a) The top determined percent of all #3 through #8 contestants move up 1 number. (3 to 4; 4 to 5; 5 to 6; 6 to 7; 7 to 8…) b) The bottom 10% for example, of all contestants #4 through #9 will will be given the opportunity to move down one rating. With the exception of the #1 Beginner, #2 Rookie, and the #3 Novice, this will be done for every classification category at the end of each sorting season and at least one additional time each year. This guarantees fair and equal treatment of every contestant. A Beginner automatically moves up when he or she wins 3 checks or $500, which ever comes first, in CINCH RSNC events. A Rookie automatically moves up when he or she wins $1,000.00. The only exception is if their win/loss ratio in #6 and below divisions is excessively low. Then that contestant will remain a #2 until they earn $1,500 at which point they will automatically move -to- When the contestant earns $1,500 they will be re-evaluated; if they remain a #2 they will be reevaluated on their win-loss ratio at every $500 interval of winnings before they are moved. Both Beginners and Rookies can be moved up regardless of their winnings if it is determined that their sorting abilities are superior to the level of competition in which they currently compete. For those contestants that have not competed enough to have adequate data to evaluate, we will lean heavily on our producers and rating committee to assure that the ratings remain fair. All #3 Novices will be reviewed every 6 months (after the World Finals and State Finals) and will be moved accordingly based on win/loss ratios in #11 and below divisions. This will bring more consistency to the ability of the #3 rating and be fair for all contestants. Data Driven Rating Evaluation is the contestant’s data and will be collected and carried over from one year to the next, until as determined by CINCH RSNC he or she has competed enough to accurately depict a contestant’s performance. CINCH RSNC will use 9 rating classifications. All contestants regardless of age, will be assigned a rating classification. 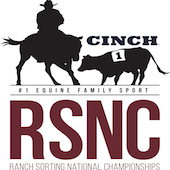 Each new member of CINCH RSNC must be given a rating classification before competing in a CINCH RSNC sanctioned event. The member is required to accurately and honestly answer all questions regarding his or her rating criteria. New Membership Probationary Rating is where all new members will compete on a probationary rating for their first year of competition. If for any reason it is found by CINCH RSNC that the person is inappropriately rated then CINCH RSNC will correct the rating. If that person is found to have falsified information about his or her rating then CINCH RSNC may revoke the membership of that person. The #1 Beginner rating is only for those participants who are novice riders on novice horses and who have never won 3 checks or over $500 in any sorting or othe cow horse competition. Once you win 3 average checks or $500 (excluding youth checks) you will automatically be moved to a number 2. This is only an introductory level and is probationary meaning if you or your horses skill dictate it you may be moved at any time. The #2 Rookie The #2/Rookie rating is only for those participants that have never been rated higher than a #1 in any sorting or other cow horse organization and is a novice rider on a novice horse who has never won over a $1000 in any sorting or other cow horse competition. Once a #2/Rookie’s earnings in CINCH RSNC sanctioned events reaches $1000 (youth classes excluded) and that amount has been confirmed and recorded at the CINCH RSNC Headquarters, he/she will no longer be eligible to ride as a #2 Rookie unless their win/loss ratio is excessively low in the #11 and below divisions or in all classes combined. If both win/loss ratios are below a 0.60 then they will remain a #2 until they earn $1,500 at which point their win/loss ratio will be evaluated again and again at every $500 interval. A Novice is defined as a #3 rated contestant that is inconsistent in their ability to sort cattle whether it is because of their cattle reading ability, their ability to get successful partners and/or the ability of their horse. Any new member that has won over $1000 in Ranch Sorting or other cowhorse competition will not be rated below a #3 Novice. Additionally the #3 rating will be reviewed by win/ loss ratios in #11 and below divisions every 6 months (after the World Finals and State Finals). An Amateur is defined as a #4, #5 or #6 rated contestant that is just below or just above average in their ability to sort cattle. This is a contestant that can read cattle, is aggressive and confident and is riding an athletic cow horse. From time to time this contestant or their horse will make minor errors that prevent them from consistently sorting. Those that are considered just below average should be a #4 and just above average should be a #6. An Open Rider is defined as a #7, #8, or #9 contestant that excels within the sport of Ranch Sorting. These are experienced sorters that have continued to improve and advance within the rating system or professional horseman that have recently entered the sport and their horses and sorting abilities dictate that they are superior to the Novice and Amateur contestants. These could be cutting horse and cowhorse trainers that in a very short period of time have learned how to be competitive in sorting and have advanced to the open level. There are three levels within the open division. The #7 is considered to good to ride as an Amateur, but either doesn’t have an exceptional horse or who may have a slower reaction time than the best riders in the industry. This contestant’s win/loss ratio prevents him/her from advancing. Teams whose combined ratings are higher than the division number or division cap will forfeit their winnings. It is the responsibility of the Producer as well as the Member to make sure that they are riding at their current rating. Beginners and Rookies move up throughout the year. All #3 rated contestants are evaluated twice a year. For the 2018-2019 season, classification letters and membership status letter will be issued after the World Finals and good through the 2019 CINCH RSNC World Finals. All new members are assigned a probationary rating for their 1st year of competition. If at any time within the first year it is determined by CINCH RSNC that the contestant is mis-rated, the rating will be adjusted. At the end of each year all contestants’ statistical data will be evaluated and ratings will be adjusted. This classification system is used to limit the margin of error in setting sorting categories. It is based on statistical data rather than opinion and it treats each member identically and fairly. Each contestant is classified or rated with a number 1 through 9, with 9 being the most advanced. Your classification number is your performance rating. The sum of your classification number and your partners’ classification numbers cannot exceed the number of the sorting division. This procedure closely defines the caliber of each sorting division. A rating committee will be in place to review all questionable ratings at the World Finals. It will be the committee’s sole responsibility to observe and review all questionable ratings of contestants. The committee will consist of four individuals at any one time, three will vote on a rating adjustment with a unanimous vote required for a change. That change will be in effect the next division in which that contestant competes. If there is a conflict of interest by a person on the committee, that person will not vote and the fourth committee person will replace them. The committee has full authority and will be 100% supported by the association. We want members to know that fairness is our utmost priority and CINCH RSNC will not allow underrated contestants to continually compete at the wrong rating. CINCH RSNC has instated a rating review program for any contestant that does not believe their current rating is accurate. The review requires a $200 up front deposit. If after a minimum of 45 entries under the new rating, the win/loss ratio shows that the contestant falls within the bottom 15% of ratios for that rating, then the contestant’s rating will be lowered and the $200 will be refunded. If the rating is not in the bottom 15%, the $200 will be forfeited and the rating will remain.